*40% of Huron, 13.3% of Erie, and 36.5% of Wabash properties decreased their listing price. The “% Change from Original List Price” figures are averages only among houses that revised their price. Below are the distributions of sold properties, divided among quarters of the year (January through March, April to June, July to September, and October to December) for the units in The Pinnacle (Huron), 55 East Erie, and The Trump (Wabash). 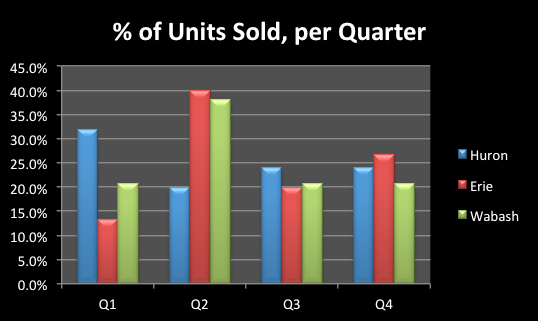 The scale indicates during which quarter properties were sold. For example, the majority of 55 East Erie’s properties were sold during the second quarter of the year, or during the months of April, May and June. An easier way to visualize and compare all three areas is the bar graph below. Note that now the colors do not correspond to the time of the year, but rather to the locations.